All characters in my stories are copyrighted characters in a copyrighted story. Downloaded for personal use only. Any publication of these characters in any form without prior written permission is strictly forbidden, and is a violation of US and international copyright law. I called this The Meat Market Edition because there's at least one other version of Codi Jo's self-sim around here somewhere. Once upon a time, our very own Codi Jo was urgently needed at The Meat Market to fill in some holes in the plot. She arrived in the company of a bunch of superheroes, and the place hasn't been the same since! I wanted to see if I could capture the essence of Codi Jo, and with Codi Jo's kind permission, here she is! It was just a matter of pouring enough Kahlua and rum into her to get her to hold still long enough. She has a heritage from some of the greatest Sims artists. Codi Jo's skin tone is the same as Anja's Girlfriend Sheila Nordstrom, posted at InSIMAdult. If you installed Sheila, you don't need to install it twice. The body shape is 34Dn36, mislabled as 36Dn36. Caution: Codi Jo's skin tone is anatomically accurate. Parental discretion is advised. For the top, get MESH_afTop_34Dn_Tshirt - from Warlokk's Hi-Res Bodyshapes - 34D Enh/Nat Tops Separates Collection. For the skirt, get MESH_afBottom_36_ShortSkirtShoes from Warlokk's Hi-Res Female BodyShapes - Bottoms Separates. The skirt texture is from that same thread but Body Shop also packaged it with this download. For the hair, get XMS_Flora_MeshHair036 from XM Sims, page 49. Isn't it nice when everything balances? No Pests: I made this sim with just University and the base game installed, so it should work with all versions of The Sims 2. This is an adult sim, so she would tend to tower over the real-life Codi Jo's 5'2" frame. If you want to be really accurate, you could try making her shorter or use the Insimenator to change her age to an emancipated teen. These clothes won't fit the teen-sized version but she will adapt her body shape to match and the skin tone will still work. Especially for you, Codi Jo! The real-life Codi Jo Corley was killed in a one-car accident on March 23, 2007.
car rolled several times, and both of them were killed. Greg I hate to be so lame but who is this Codi Jo? Greg met Codi Jo on the InSim board and persuaded her to come hang out at the Hullabaloo, where the rest of us met her. Yup, what Rose said. She was sort of the Great Muse of the Insim boards since just about the time Insim opened. Thank you very much, Codi Jo was very beautiful and seemed a truely fine person. Yeah. Darn, I still miss her! ..... And oddly Codi Jo has some small degree of immortality by living on in our games. In the long run, that is as much as anyone can hope for. I still miss her. She's beautiful, Greg! I'm sorry to hear about the real-life Codi Jo. Thank you for writing such clear instructions about everything I need to install her in my game. I came back to say: It's amazing how fast your server is. It took less than 30 seconds to download all 3 megabytes of Codi Jo! Thanks, Coco. 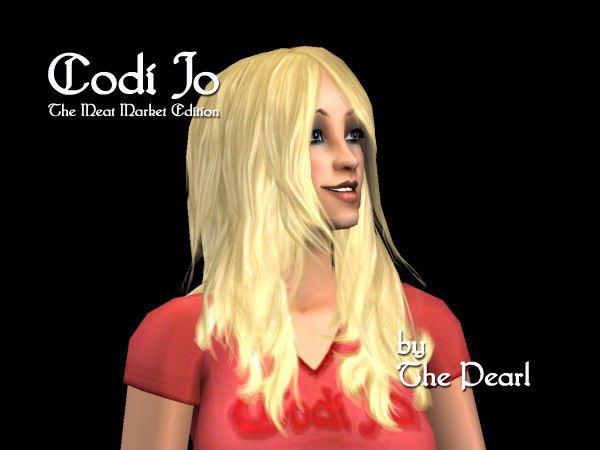 I tried to do justice to the real-life Codi Jo. We're on pair Networks. They're sort of legendary for being fast; and their servers are in Pittsburgh so you're probably not seeing as many network nodes as most folks. I'd guess that you are at most four hops from the server. You can't go wrong with those coal-fired servers from Pitt! Codi Jo is very beautiful, Greg. I think it's the steam-powered switching network that does it. Thank you, Reader. The original Codi Jo was a very beautiful girl, too. Yes she was. I still miss her even if I never talked to her. She was always happy and fun.